The caves of the Ozarks are home to many sorts of cave life. Our damp, moderated temperature conditions make ideal homes for many cave adapted species. In addition to the scientific classification, cave life is divided by its ecological niches--that is grouped by how and where they live. Some systems include phreatobites or dwellers in spaces too small for man. Although caves many seem like sterile places when compared with the surface, this is definitely not the case. From the many species of microorganisms, some of which are still unidentified, to the more well known bats and salamanders, most Missouri caves are anything but lifeless. Life underground is much different because it does not seem to be plant-based. Nothing is further from the truth. Nearly all food must come in from the outside. Most cave animals are scavengers for food--so little of it occurs underground that nearly anything might be considered lunch. Plant matter can be brought in by water, or attached to animals. Some cave animals are so adapted to using any food value at all that a guano sandwich sounds good. (Because of this, bats play an important part in many cave ecosystems.) Due to the lack of sunlight, some caves (not in Missouri) are populated by strange animals who can live in sulfur rich environments, and utilize energy in ways we are only beginning to understand. Because of food being naturally scarce, cave life has adapted. An excess of food, while seemingly good in the short run, can upset the balance of a cave in favor of animals who aren't particularily cave adapted, and with disastrous results for the cave creatures. How comfortable an animal is underground, and where they get their food helps to define any animal as a member of one of the four main types. --Are animals which either have become trapped or are disoriented in the dark underground. They would starve very fast if left there for any length of time. Some examples are turtles, surface fish, snakes deep in the cave, and most mammals which do not den underground. --Are animals which occasionally go into caves, and may even use them for part of their life, but which get their food from the outside. Bats, mice, bears, raccoons, some cats, frogs, some salamanders and some insects like crickets are examples of trogloxenes. --Are cave lovers. These animals seem equally adept at living and finding food inside or outside of the cave. They may be partly cave adapted, but not so much that they would find life outside, under proper conditions, unbearable. Cave salamanders, most sculpin and springfish are examples of troglophiles. --Are completely cave adapted. They have evolved so that life outside the cave would be very difficult. These are the blind, white creatures whose metabolisms can operate at a slow rate for many lean years and are mostly omnivorous. Cavefish, cave crayfish, millipedes, spiders, and other strange crustacea and invertebrates are troglobites. There is some evidence that troglobites migrate through rock spaces too small for humans, and that is the reason that some of the more cave adapted water troglobites may be referred to as phreatobites--from the phreatic zone, the place beneath the water table. Of note in Missouri are two (possibly three) known species of federally listed as endangered bats: the Indiana bat Myotis sodalis, the gray bat Myotis grisescens, and perhaps the Ozark big-eared bat Corynorhinus townsendii ingens. We have three troglobitic cavefish, the federally threatened Ozark cavefish Amblyopsis rosae, the southern cavefish Typhlichthys subterraneus, and the grotto sculpin, a new cave adapted discovery still undergoing study. Likewise, a new species of the cave crayfish genus Orconectes was found here in 1999, a new companion to the better known Cambarus hubrichti the Salem cave crayfish, and Cambarus setosus the bristly cave crayfish. 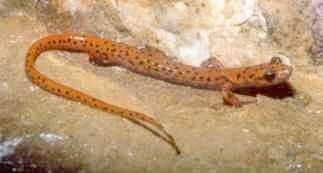 We have the cave adapted grotto salamander, Typhlotriton spelaeus, not to be confused with the cave salamander Eurycea lucifuga, which is a troglophile, and a bright orange, not a pale pink. There are also a number of cave snails, amphipods, and other cave adapted invertebrates which are found nowhere else in the world. All of our cave life is protected by law, and permits are required to possess them. With increasing threats from disturbance by man, and their limited range as cave animals, we ask that you respect their right to be and do not harm them. The MSS has members who are outstanding experts on our cave life, and most are willing to share what they know, in an effort to understand and protect them.